Lumina works with employers to encourage their investment in and recognition of postsecondary credentials. Employers have the most to gain from a better educated workforce—many employers are taking steps to improve the educational attainment of their own employees. Read more about these studies and stay tuned for more to come. 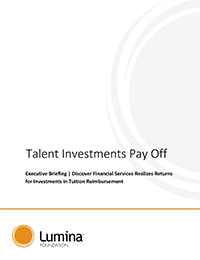 From 2010 to 2013, Discover’s tuition reimbursement program produced an overall 144% return on investment as a result of avoided talent management costs due to higher rates of promotion, transfers and retention and lower rates of absenteeism. Employees participating in the program received, on average, annual wage increases that were at least 41% greater than non-participating employees, while helping Discover save $10.9M. 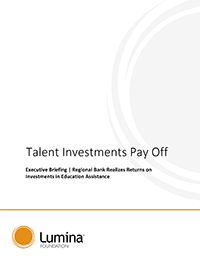 From 2011 to 2015, Regional Bank's tuition reimbursement program produced an overall return on investment of 10% ($700K in net savings) as a result of avoided talent management costs. Workers who took advantage of the program achieved increased career opportunities. From 2012 to 2014, a large communications technology company (masked as “Large CommTech”) provided employees $138M in tuition assistance through its Tuition Assistance Program (TAP). That program resulted in 39.2% ROI ($54.2M net savings), as a result of avoided talent management costs. Both the business and employees benefited as a result of TAP investments. An analysis of health insurer Cigna’s Education Reimbursement Program (ERP) shows every dollar the company puts into the program is returned and generates an additional $1.29 in savings—a 129 percent return on investment. Lumina Foundation, a national foundation focused on increasing postsecondary attainment partnered with Cigna to design the study, which was conducted by Accenture, a leading global professional services company.